at UC-Irvine and new editor of the EREH. As an undergraduate at the University of Minnesota, I read two books that peaked my interest in economic history. The first was Robert Fogel's Railroads and American Economic Growth: Essays in Econometric History, and the second was Doug North's Structure and Change in Economic History. I thought Fogel's methodology of counter-factual history was very innovative and gave a shocking answer to a big question. I wanted to imitate Fogel's work. North's books was inspiring in that it provided a perspective on the long-run and stimulated my thinking on the role of the state. I have been grappling with this issue ever since. As new editor of the EREH, what role will you play in the journal? My role as editor is three-fold. The first and most important is to ensure that the best papers get published. My second role is to encourage high quality submissions to EREH. Third, is to promote research in economic history more generally. In general, what do you look for in a submission and how would you describe the perfect EREH article? In my view the best papers tell us something new about economic history and are well executed. Novelty is important because the field of economic history needs to continually advance. Good execution is also important as we would like the results of published papers to be regarded as credible or believable long into the future. I should add that in terms of methodology, I don't believe there is any 'right' approach to economic history. I am regularly surprised by new and informative approaches to research. For the last decade, there has been a trend in economic history towards greater theoretical rigor and improved identification in econometrics. I see this trend as continuing for the foreseeable future. However, I would hope that scholars don't focus exclusively on identification when choosing their research questions. Economic history has always focused on the big questions, like the sources of the Great Divergence, even if a precise answer cannot be given with current data or techniques. There will always be room in the field for more exploratory research. For this meeting we particularly encourage papers on all aspects of ancient economy and early economic developments, but submissions from scholars working in other areas may be considered. Prospective speakers should submit a one-page abstract and a short CV via the link on the FRESH website by May 31. Notification of acceptance will be given by July 1. Economic history at Universidad Carlos III de Madrid. How has freedom evolved over time? A distinction has been made between ‘negative’ freedom, defined as lack of interference or coercion by others (freedom from), and ‘positive’ freedom, that is, the guarantee of access to markets that allow people to control their own existence (freedom to) (Berlin, 1958). An example of negative freedom is economic liberty. A country will be economically free in so far privately owned property is securely protected, contracts enforced, prices stable, barriers to trade small, and resources mainly allocated through the market (Friedman, 1962). Empirical research on economic liberty has been restricted to the last decades (de Haan et al., 2006). The resulting indices of economic freedom exhibit wide spatial coverage but their time dimension is limited and, in the most comprehensive measure of economic liberty, the Fraser Institute’s index, only goes back to 1970 (Gwartney et al., 2013). The lack of a long-run perspective reduces the value of its lessons and policy implications, with the risk of identifying what it is specific to the recent past, with empirical regularities that apply across space and time. A new Historical Index of Economic Liberty (HIEL) provides a long-run view of economic freedom and its main dimensions for today’s advanced nations, more specifically, those included in the OECD prior to its enlargement since 1994 (Prados de la Escosura, 2014). Given the bounded nature of any index of economic freedom, the use of its percentage change or rate of growth would be misleading as increases achieved at low levels cannot be matched at high levels. It is preferable, then, to look at the absolute shortfall of economic freedom from its upper bound at the initial point and, then, compute its relative decline over a given period. Thus, the improvement is measured as the proportion of the maximum possible (that is, the reduction in its shortfall). The Historical index of Economic Liberty, HIEL. Economic liberty is higher nowadays in the OECD than at any time over the last one and a half centuries and, probably, in history. Over 1850-2007, the shortfall declined by nearly three-fourths. However, its evolution has been far from linear. Different phases can be established. From the mid-nineteenth century to the eve of World War I steady advancement of economic liberty took place across the board, peaking in 1913, although it is up to early 1880s when most of the action happened. Over three-fourths of the overall progress in economic liberty in the OECD up to 2007 had been achieved before World War I. During the first half of the twentieth century economic freedom suffered a severe reversal. After a dramatic decline during the war and its aftermath, the recovery was fast and peaked by 1929, but at the level of the late 1890s. The Great Depression pushed down economic freedom again and the post-Depression recovery did not imply a rebound of economic liberty so, by the eve of World War II, it had shrunk to the level of the early 1850s. Economic freedom expanded in the second half of the twentieth century and peaked by 2007. 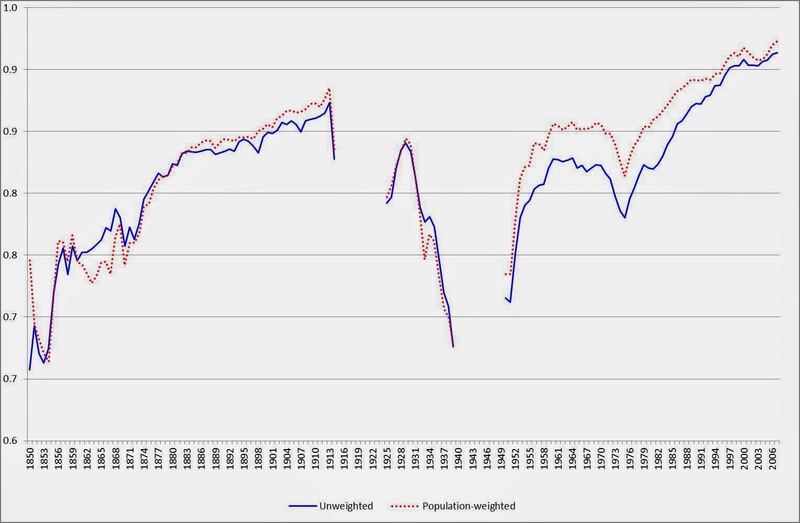 However, in between two expansionary phases: a quick recovery in the 1950s and a post-1980 expansion, economic freedom came to a halt, stabilising during the 1960s around the late 1920s level, and declining in the early 1970s. From the early 1980s to the eve of the current recession, a sustained expansion took place, overcoming the 1913 peak after 1989 and reducing the early 1980s shortfall to half by the mid-2000s. In the last two decades the highest levels of economic freedom have been reached. Improvements to economic liberty, by dimension and period. Over time improvements in economic liberty derived from different dimensions. Thus, between 1850 and 1914, the improvement in property rights made the main contribution. Then, during the first half of the twentieth century, it was the collapse of freedom to trade internationally the main responsible for the contraction in economic liberty. Since the mid-20th century, specifically in the 1950s and the post-1980 era, the liberalization of trade and factor flows was the leading force, accounting for more than half of the reduction in the economic freedom shortfall over 1950-2007. 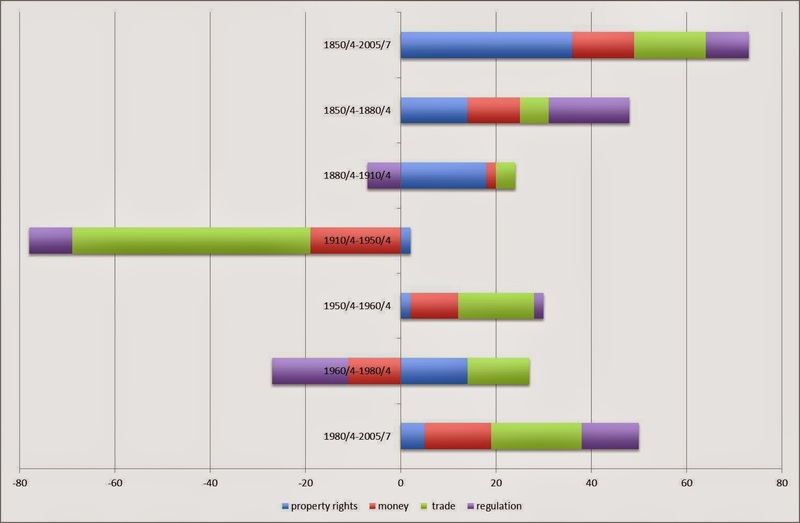 During the 1960s and 1970s, increases in regulation and unsound monetary policies offset the gains in freedom to trade and improvements in property rights. Overall, improvements in the legal structure and property rights emerge as the main force behind long-term gains in economic liberty during the last one and a half centuries. The trends exhibited by the new historical index of economic liberty raise pressing questions. If economic freedom is usually associated to economic growth, how can we reconcile good economic performance in the OECD during the 1960s and early 1970s with stagnant and relatively low levels of economic freedom? Furthermore, are there any trade-offs between economic liberty, as a negative freedom, and other kinds of positive freedom, in particular, human development and democracy? Answering these questions provides an exciting and worth pursuing research agenda. 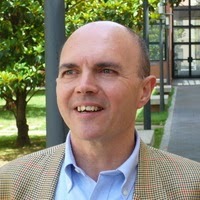 One particularly controversial issue in recent case of the Abilitazioni Scientifiche Nazionali in economic history in Italy has been the decision of not considering co-authored publications that did not include an explicit statement in which it was indicated the individual contribution of each author to the different sections of the paper. Below, we publish two letters of editors of the leading journals in the field of Economic History and in the field of History of Economic Though that provide an important clarification concerning the editorial policies of these journals concerning co-authored papers. Stating the obvious? Apparently, sometimes it is necessary. We have been informed by our Italian colleagues that the ASN Commission is developing criteria that will govern academic promotion in Italy. As we understand it, the ASN rules (DM 76/2012, art.4, sec. 2, letter B) state that the Commission must check for “the individual contribution in the case of co-authored works.” We, the undersigned editors of the principal international journals in the history of economic thought and economic methodology, believe that we can contribute important information to the ASN committee for the history of economic thought and economic methodology regarding the nature of the international practices for our specific discipline. In conjunction with our editorial boards and the community of scholars who aid in reviewing scientific articles, we largely determine which papers are published in the peer-reviewed journals in our field. Co-authorship of articles in the wider economics discipline is increasingly more common, so that, in many subfields of economics, it is the rule, not the exception. Co-authored articles do not yet dominate the history of economic thought and economic methodology, although they are very frequently encountered. The nature of scholarly collaboration in our field does not typically admit of any neat division of the total credit for a scholarly article into the individual contributions of its co-authors. As a result, we do not encourage – much less require – authors to report their individual contributions in the published versions of their articles. Our presumption is that the co-authors are each equally responsible for the final product, except in those rare cases in which the co-authors volunteer to apportion the credit in some other way. We also adhere to the common practice in several fields – though we know some other fields may follow a different one – in which co-authors are listed alphabetically, with no implication that the order of listing conveys any information about the importance of an individual co-author’s contribution. Exceptions to this rule are rare and, again, at the discretion of the co-authors themselves. The increasing prevalence of scholarly collaboration and co-authorship represents a vital element in scientific progress in many fields. We hope that the ASN committee for the history of economics/history of economic thought/economic methodology will not adopt rules that in any way discourage such collaboration by penalizing co-authors who fail to apportion their individual scholarly contributions within published articles. It would be particularly invidious to discount those articles completely in assessing the fitness of scholars for promotion. Much of the best work is co-authored; apportionment of scholarly effort into distinct shares is often impossible; and none of the major journals in our field require, nor even encourage nor welcome, such apportionment. Following the letter of the editors of the history of economic thought and economic methodology journals JEM, HEI, HOPE, JHET, EJHET we would like to state that, in the field of economic history, the international journals we edit operate a similar editorial policy to that expressed in their letter. In our journals the majority of articles are co-authored. We rarely publish statements that delineate the specific contribution of each author to the different sections of the paper. The norm is for authors simply to be listed alphabetically, unless there is some desire by the authors to assign more credit to one of their number. Alphabetical listing implies that the authors all made contributions of equivalent value. We operate with such a convention because, unlike in some fields of physical science, papers in economic history still typically have small numbers of co-authors, and it is the norm to only list as authors people who have contributed substantially, and in broadly equal measure, to the writing of the paper, the research design, and the data collection. Stephen Broadberry, LSE, London. Co-Editor, Economic History Review. Gregory Clark, University of California, Davis. Co-Editor, European Review of Economic History. William Collins, Vanderbilt University, Nashville. Co-Editor, Explorations in Economic History. Claude Diebolt, Université de Strasbourg. Editor, Cliometrica. Şevket Pamuk, Bogaziçi University, Istanbul. Co-Editor, European Review of Economic History. Paul Rhode, University of Michigan, Ann Arbor. Co-Editor, Journal of Economic History. 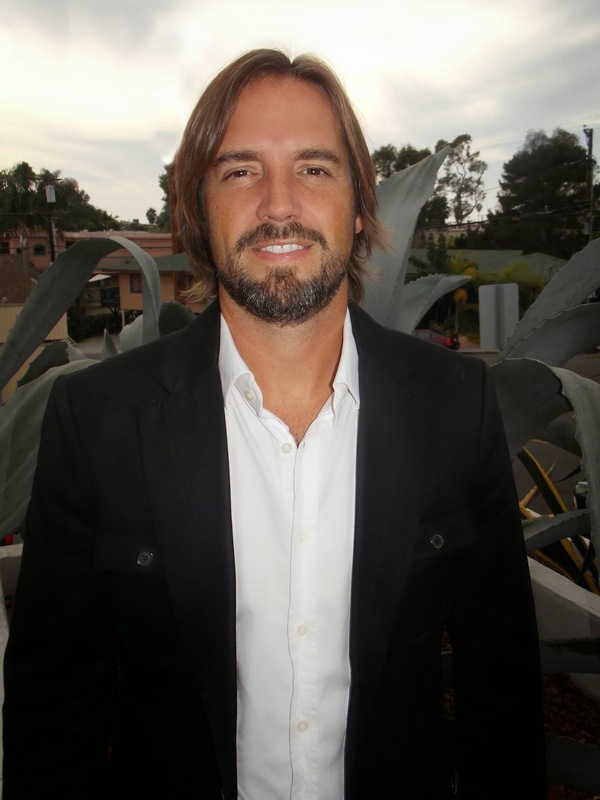 Jean-Laurent Rosenthal, Caltech, Pasadena. Co-Editor, Journal of Economic History. Hans-Joachim Voth, University of Zurich. Co-Editor, Explorations in Economic History. Nikolaus Wolf, Humboldt University, Berlin. Co-Editor, European Review of Economic History. The Frontier Research in Economic and Social History (FRESH) organizers are pleased to announce that at the recent European Historical Economics Society (EHES) trustees meeting on March 29, 2014 it was decided to incorporate FRESH within the EHES. FRESH will continue to be supported by and administered from the University of Southern Denmark and the Historical Economics and Development Group (HEDG), but we believe that becoming an initiative of the EHES gives us the solid academic backing we need to continue promoting economic history and the FRESH workshop format around the world. Moreover, the EHES has generously offered to fund each FRESH meeting, so that we can offer some limited financial support to junior scholars who wish to attend, enabling even more to benefit from the high international standards of our workshops. Would you like to organize a FRESH meeting? FRESH meetings have no permanent venue but take place at any institution around the world where there is an interest in having the FRESH meeting. Hosting institutions will be asked to provide a venue, including electronic equipment, and lunch and dinner for the meeting participants (usually 10-15). If you would like to organize a FRESH meeting at your institution, please contact the meeting organizers (contact details on the FRESH website: www.sdu.dk/en/ivoe/fresh). Would you like to keep updated on FRESH activities? There are two ways to sign up for updates on our activities. You can either ‘like’ FRESH on our facebook page (www.facebook.com/freshmeetings), or you can subscribe to eh.news at eh.net. As members of the Boards of the Italian Associations of Economic History (SISE) and the History of Economic Thought (AISPE), it was with surprise and dismay that we read the letter you sent to the Prime Minister and other Italian authorities regarding the results of the qualifying examination for the certification of professor of Economic History. It is not for us to dispute the choices made by the Commission responsible for the certification procedure, the minutes of which are available online for consultation and which we assume you read carefully prior to sending the letter. Your observations presume that the evaluation criteria adopted were arbitrary and inadequate. However, it must be remembered that Italian university professors are employed by the State and that the selection procedure is regulated by specific Government regulations which, while they may seem anachronistic, must be adhered to. Moreover, as representatives of Italian academics of Economic History and the History of Economic Thought, whose reputation has been compromised by your intervention, we feel it is our duty to clarify some points. The summary judgement which you pronounced is based exclusively on the criteria of international visibility as an indicator of the quality of an academic. While this is certainly an important factor, it is not the only one to be taken into consideration when evaluating a researcher. Economic Historians in Italy have widely discussed the scientific statute of the discipline and the methods for evaluating research and agree on the fact that only the careful, critical reading of a book, paper or article can allow us to express a valid judgement, in other words “the proof of the pudding is in the eating”. It is well-known that the widespread use of bibliometric criteria is a more immediate application tool, but it is also true that these methodologies are subject to severe criticism. The fact that most of our scientific production is in Italian obviously makes an international comparison difficult, but this does not give the right to make superficial judgements on a historiographic tradition such as the Italian one which has contributed to the general progress of Economic History and the History of Economic Thought not only with publications in Italian but also in French, Spanish, German and English. We are in no doubt that your letter was based on a misunderstanding and that collaboration and mutual respect between Economic Historians in Italy and colleagues in other countries will continue to be fruitful.